To survive out there among the "cagers", we have to assume we're invisible while at the same time making ourselves, and our bikes, as conspicuous as reasonable. 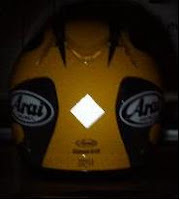 Many commuters and sport-tourers know the value of adding retro-reflective materials to both motorcycle and rider. Originally developed for sea-going folks, SOLAS (Safety Of Life At Sea) tape is the most "reflective-y" material I've found, seemingly bouncing back more light than hits it. It's the most expensive as well -- you can buy it in bulk from industrial suppliers (like this one) for a fraction of what motorcycle product vendors want for it, and then share the excess with your riding buddies. For years I've put a thin strip of SOLAS on the top edge of my helmet's faceshield (and no, I don't see the reflected light from inside the helmet) and little bits on the rear as well. Those with artistic bent could get quite creative as SOLAS stretches well and cuts easily with an Exacto blade or scissors. Below are photographs taken in a dark room while shining a flashlight at my current helmet to approximate a car's headlights. 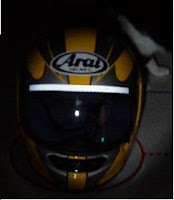 (The furry object behind the helmet is one of my curious cats). In Part 2 I'll show how I use SOLAS tape on my bike. Thanks! I like your website as well. I don't read Spanish, but I'm a big fan of MotoGP so I can admire the photographs.